Step 5. Orthopedic or Surgical Consult. Not much fun at all. 1. Hurt themselves via injury or via laziness and de-conditioning. 2. Ignore the pain and continue to hurt or de-conditional themselves. 3. Try drugs to make the pain “go away”. 4. If drugs do not work well enough, skip all non-invasive or conservative methods and go straight to your Primary Care Provider who will probably have no clue what to do and whom will then refer you to a PT (a reasonable thing to do) or an orthopedist. If a course of physical therapy doesn’t make the pain “go away” then surgery is on the menu. The American Association of Family Physicians, the American Medical Association, and numerous other organizations recognize chiropractic care as an appropriate and safe first-line conservative approach to effectively treat lower back pain (and neck pain). Still, less than 8% of people in the United States see a chiropractor. Most choose the “easy” route of drugs or denying a problem exists. They then mask the symptoms until they are so severe that surgery is the only option, or they just do nothing at all until it’s so bad there are very few options. Do yourself a favor and if you are experiencing lower back pain, especially if it’s possibly disc or nerve related and is causing pain into the legs or buttocks, go to see a chiropractor (or even a PT or a massage therapist) and treat your very real and potentially very troubling pain in a responsible and conservative manner so that you preserve the useful life of your spine and don’t end up shuffling around when you’re 65 years old and unable to enjoy your retirement because you were too young and dumb or busy or whatever to make a better choice in your 20’s, 30’s or 40’s. Two chiropractors in Frederick that are practicing at Park Bench Chiropractic are known for helping their patients get rid of nagging sciatica, a type of pain caused by pressure or irritation of the sciatic nerve. This nerve that is found in the low back, buttocks, and leg can cause sharp pain, tingling and numbness, or other problems. Frederick chiropractors Dr. Romano and Dr. Schooley are trained in methods to reduce or eliminate back or leg pain or numbness due to sciatica. At a recent visit to their warm and inviting office in Frederick, Dr. Romano showed how patients can get relief from low back or sciatic nerve pain. I was examined to make sure that the problem really is the sciatic nerve, and what exactly is causing the nerve pain, and then a treatment was recommended involving chiropractic adjustments. Sometimes the problem is caused by a muscle, sometimes by the disc, and sometimes just by the bones being misaligned and causing inflammation. I never knew it could be all those things! For me, it was the disc and this involved coming in to the office three times per week for a few weeks and being “adjusted”. The doctor places you on a padded table and adjusts your low back with his hands. Sometimes there is an audible “pop” and sometimes there isn’t. It isn’t as scary as I thought it might be, and the relief is amazing. 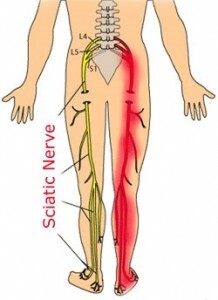 While chiropractic isn’t what everybody needs for their sciatic nerve pain, for me it sure did the trick. Both doctors are very similar in the way they treat patients, and they are very gentle – much more gentle than I thought this would be! If you are suffering from sciatica or low back pain, stop by or call our office to set up a consultation. Park Bench Chiropractic is located in Frederick, Maryland at 1780 North Market St. Our office phone number is (301) 378-0334. We look forward to hearing from you soon! Now, don’t get me wrong. It’s not like I am saying you can just wish chronic pain away. It’s not that easy. But the right attitude can really help you cope with, or even move beyond, your pain. Moving well helps you feel well. Feeling well helps you move well. Not feeling good and not moving well will perpetuate you not feeling well, and will make you in fact feel worse. All of that is downright depressing. All of this plays into a vicious cycle. Having a positive mental attitude is a conscious choice you make to be optimistic and to avoid anxiety. It is easier said that done some days, but it will pay dividends. Can your mind overcome your pain? 2007 research from the University of Toronto showed that chronic back pain patients were more likely to recover more fully, and sooner, when their doctors appeared confident and reassured the patient that they would get better. “Pain is always subjective and is defined by the person who experiences it”. When you do feel pain, instead of letting your anxiety make your decisions, utilize a coping strategy like enjoying a glass of wine or spending a few moments in your favorite chair, or maybe both at the same time. Pain, as a form of sensation, stands out from the other senses somewhat because it is subjective.That means that you can cut three people with the same razor in the same place on their arms, and they will describe the pain differently, and likely they will describe the level or pain differently. This means there is a mental component to pain. While that mental components is not well understood, it does exist, and we should all try to harness that to deal with our pain. When pain is chronic, your goal should either be to stop the pain or learn to manage living with it. When you pain makes you want to avoid activity, instead be as active as the pain permits. Make the choice to stay active. Make a plan on how to maintain a bright outlook on your situation, and remain optimistic about resolving it and enjoying your life. This plan should be a REAL PLAN, in writing, with a step-by-step process and it should include a reward system to reinforce progress in meeting your goals. Dr. Romano is a board certified and licensed chiropractor in Maryland. He practices in Frederick, Md at 1780 North Market Street. He has an interest in the science of pain and it’s relationship to chiropractic. He has a Bachelor’s Degree in Psychology and a Doctorate in Chiropractic. Dr. Romano and Dr. Schooley are available to speak to groups about pain, the psychology of health, the importance of a healthy nervous system, and other health topics. There are 3 types of stress: physical, chemical, and emotional. When you are stressed your adrenal glands pump cortisol into your bloodstream. This causes increased blood pressure. Cortisol has different effects on the body when short term vs. long term. Short periods of elevated cortisol: “fight or flight”, decreased pain, burst of energy. This is to help the body cope with emergency situations – the proverbial lion encountered in the wild. Long periods of elevated cortisol: decreased cognition, suppressed thyroid function, blood sugar imbalance, decreased bone mineral density, decreased muscle mass, increased blood pressure, decreased immune function, increased abdominal fat deposition. The body’s “fight or flight” response is the opposite of the “rest and digest”/”feed and breed” response. This is regulated by the nervous system – which is made of two separate parts: the sympathetic and parasympathetic nervous system. They act at each other’s expense so that the more of one response, the less of the other – there is only so much nervous system to go around and the body must choose between rest and digest or fight or flight. That means that you can’t rest your body and repair damage, or even properly digest your food, when you are in a stressful state. And that is why we will now talk about stress reduction. Physical relaxation – think about each of your body parts, from your toes to your head, relaxing one-by-one. Mental relaxation – focus on calming thoughts, play relaxing music, and avoid stressful triggers. Try not to let things you can’t control make you anxious. If you can’t change it, then worrying about it isn’t going to do any good. You can relax in two ways: by doing something you enjoy doing and that puts your mind at ease or by doing absolutely nothing – turning the TV off, clearing your mind of troubling thoughts, and purposefully shifting your attention to something like your breathing rate or your heartbeat. Contrary to popular belief, breathing isn’t very simple. To be more precise, breathing efficiently isn’t very simple. To relax you need to take deep, slow breaths from the belly and not from the upper chest. Put your hands across your belly and feel your belly stick out as you breathe in nice and slowly. Breathe with your diaphragm, not your ribs. Many stressed out people, or people with poor posture, breathe with their neck muscles or upper chests. Breathe in through your nose, and out through your mouth. Feel your lower lungs fill with air first, then your middle lungs, then your upper lungs. This will take 5-10 seconds. Once you have fully inhaled through your nose take a 1 or 3 second pause and then gently let the air out. Repeat until you’re relaxed or asleep. If you are getting dizzy, you’re overdoing it. Try to totally surround yourself with your own relaxing imaginary environment. Close your eyes. Imagine yourself at this place, maybe the beach. Feel the warm sand under your nice, clean towel. Feel your body relaxing on the sand, and it’s contouring to support you comfortably. Imagine the hot sun heating your skin with a gentle sea breeze keeping you cool. Hear the wind rustling through the trees in the distance, and hear the tide moving towards you on the beach then pulling back into the waves. Hear sea gulls somewhere far away. Focus on that for a few minutes and you have no choice but to be relaxed…unless you don’t like the beach! Dr. Romano is a board certified and licensed chiropractor in Maryland. He practices in Frederick, Md at 1780 North Market Street. He has an interest in the science of pain and it’s relationship to chiropractic. He has a Bachelor’s Degree in Psychology and a Doctorate in Chiropractic. Dr. Romano and Dr. Schooley are available to speak to groups about pain, stress, the importance of a healthy nervous system, and other health topics.